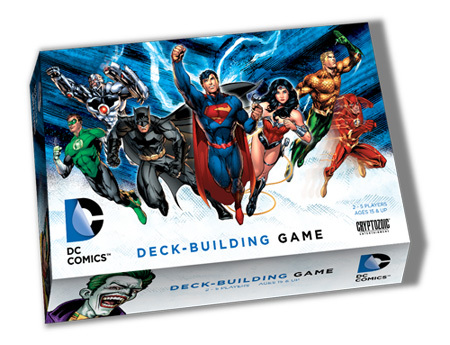 Out in late September or early October, game company Cryptozoic attempt to work their magic with a deck-building game based on DC Comics’ universe of characters. 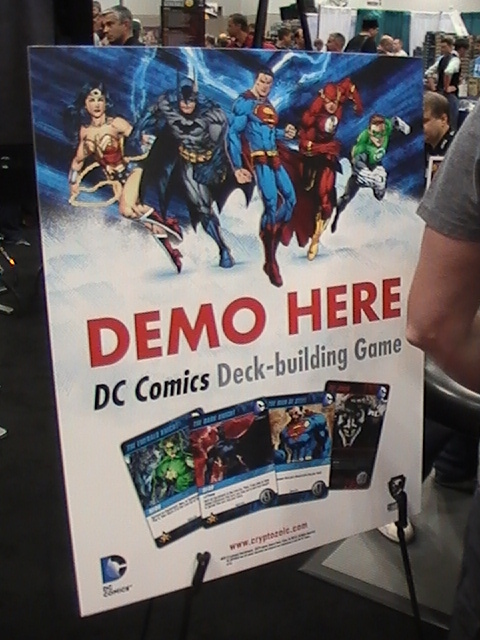 The game is imaginatively titled, DC Comics Deck-Building Game. I’ve played a few deck-building games in the past. The idea is pretty simple, there’s a finite set of cards and through some mechanism you gain cards in your deck competing for cards against other players. The game was fun, but I can’t say I’m too impressed, yet. I played the game as Superman, as each player takes on one of the DC titans like Superman, Batman, Wonder Woman, the Flash, Green Lantern, Aquaman, Cyborg and more. Each character provides different abilities and interact with some cards in different ways. The good is, the game is pretty simple. I didn’t have a huge background in this type of game and was able to pick it up and come up with some complicated moves in a matter of minutes. The art is also pretty good, following the DCnU style of comics. There’s also some good themes of how cards work together. There’s clearly cards with certain characters in mind and how each character works makes sense, Flash works on speed and speed based cards. It all works well. The bad is, the game, like the comics they’re based off of, are paper thin. It feels like a game-light with decent mechanics, but not the meat you’re really looking for in a game. I know there’s combos and you can play card off of card with great effect, but in my demo, I didn’t see any of that. I could of stopped paying attention and the results would have been the same. It’s very much, grab the right cards for yourself and that’s about it. There was little in my game where you’d either work against or with your opponents. So, I’m a bit unconvinced in the game. It could have been the cards we were dealt or the random people I played against, but the game was very vanilla to me without the fun interaction I want or expect in my games. Graphic Policy was able to review the game for FREE at Gen Con.